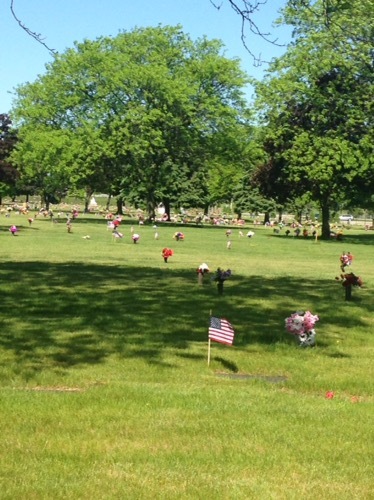 Hubby and I visited my dad’s cemetery to freshen up the site and place new decorations. My father was a WW II veteran although he never engaged in combat. However, he had his battle scars because of where he was stationed during his time in the service. He suffered severe chronic bronchitis his entire life. I have not to this day ever heard anyone cough like him. It was heartbreaking.My brother is a Vietnam veteran and was right in the thick of some of the now infamous battles we associate with Vietnam. Thank goodness he was never a P.O.W. He doesn’t talk about Vietnam to this day. I am so grateful for my freedoms. To me all the political nonsense going on is still proof that we live in a democracy. I just hope some of these so-called “protesters” realize that their freedom to protest was bought with a price. Today especially, we need to show respect to those whose political views differ from ours. As long as our rhetoric doesn’t encourage harm towards anyone, every person has a right to express their views. Let’s be the nation our parents, grandparents, siblings, aunts and uncles, and friends gave up so much for. Let’s make sure that the living veterans never regret their sacrifices and that those who didn’t make it, are remembered for the heroes they were.